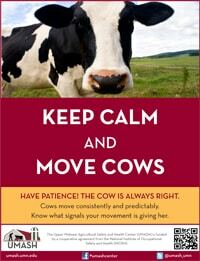 One of two “Keep Calm and Move Cows” posters developed by UMASH as part of the Multidisciplinary Network to Address Agriculture Worker Health and Safety Issues project. Dairy Stockmanship is a practice which promotes positive animal handling. Stockmanship is important for both animal and worker safety. It reduces reduces stress, increasing milk production and reducing potential injuries on the farm.